You can describe something as abstruse if you find it highly complicated and difficult to understand. If someone is addled by something, he or she is confused by it and unable to think properly. When you adduce, you give facts and examples in order to prove that something is true. Something that is arcane is mysterious and secret, known and understood by only a few people. If something confounds you, it makes you feel surprised and confused, often because it does not meet your predefined expectations. When you decipher a message or piece of writing, you work out what it says, even though it is very difficult to read or understand. A denouement is the end of a book, play, or series of events when everything is explained and comes to a conclusion. A dilemma is a difficult situation or problem that consists of a choice between two equally disagreeable or unfavorable alternatives. To divulge something is to reveal information that was once private or secret. When you speak in an eloquent fashion you speak beautifully in an expressive and persuasive way. Someone or something that is enigmatic is mysterious and difficult to understand. When you enunciate you speak or state something clearly so that you can be easily understood. Exegesis is a detailed explanation or interpretation of a piece of writing, especially a religious one. Something that exemplifies something else serves as an example of it, or illustrates or demonstrates it. To explicate an idea or plan is to make it clear by explaining it. An exposition is a setting forth of or a detailed explanation of an idea, theory, or problem, either in a written or spoken format. When you expound something you explain it in great detail, often taking awhile to do so. If you fathom something complicated or mysterious you are able to understand it. A garbled message or speech is confusing and not understandable, often because it is spoken in a hurry or is communicated with lots of accompanying noise. If you gloss a difficult word, phrase, or writing, you provide an explanation for it in the form of a note. Something impenetrable cannot be gotten through by any means; for example, an impenetrable problem cannot be solved or understood. Someone who is speaking in an incoherent fashion cannot be understood or is very hard to understand. If you describe something as nebulous you mean that it is unclear, vague, and not clearly defined; a shape that is nebulous has no clear boundaries. To obfuscate something is to make it deliberately unclear, confusing, and difficult to understand. An oblique statement is not straightforward or direct, but rather it is purposely roundabout, vague, or misleading. A parenthetical remark further explains or qualifies information. The art of pedagogy is the methods used by a teacher to teach a subject. A subtle point is clever or so fine or slight that it is not obvious, and can be deep or highly sophisticated. While giving directions to the international travelers, Jim elucidated their route by drawing a helpful and clear map. He also elucidated the confusing layout of streets in town by explaining how easy it was to get back to the central square if you followed three simple rules. Jim has a knack for explaining or elucidating difficult matters. He is a physics teacher who can elucidate and clarify complex subjects like quantum physics to his students in a plain and easily understood manner. Quiz: Try again! What does elucidate mean? To act in a thoughtful, generous way. To give clear directions when someone is lost. To make something perfectly clear by explaining in detail. If you elucidate something you make it easier to understand by giving more relevant information. Lucy's Date I don't think that I can elucidate the fact any more clearly that the fascinating and dazzling Lucy has a date tonight, and that it's not with you. 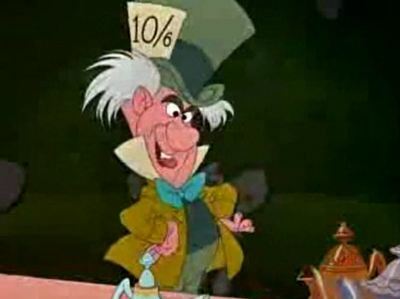 Alice in Wonderland The Mad Hatter successfully elucidates a rather strange concept.